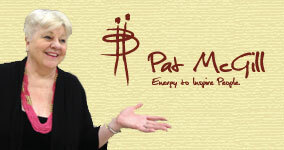 Pat McGill is a high energy, high content speaker who presents enriching and humorous workshops on many topics. “Pat does not just talk and teach, she changes lives.” Humor reigns supreme in Pat’s world. She is a high energy, high content speaker who delivers workshops, keynotes, and training seminars on topics pertinent to personal and professional development to companies, non-profits, fundraisers, women entrepreneurs, women in business and women in corporate America. Pat is the author of the famous “Purse-ology” as well as “Inspiration to Go” a book to empower women.